A Florida woman is in custody after attempting a timid, and not very well planned, bank robbery Tuesday morning, according to authorities. She slipped a note into the tube at the drive-through at the South Carolina Bank & Trust on U.S. 17 and waited for a response from the teller, said city spokesman Paul Floeckher. The teller was able to inform the manager, who called 911. Police Chief Richard Nagy said the woman did not wear a disguise or conceal the tags on her vehicle during the attempted robbery. It appeared she randomly chose the bank and didn’t do much homework. Because the bank is just down the road from the police station, three officers arrived in less than a minute. 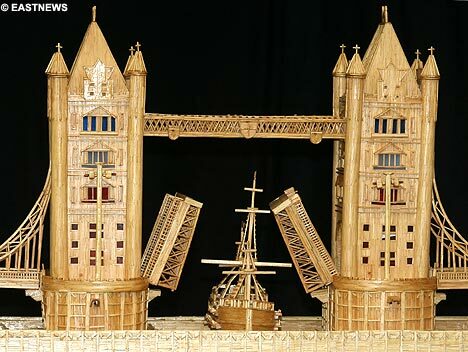 Michael Williams spent 10 painstaking years designing and building a famous London landmark…out of matchsticks. The 41-year-old road layer from Shoebury in Essex created a complete replica of London’s Tower Bridge out of 1.6million matches. He spent every evening after work lovingly crafting the 6ft-long structure which twinkles with 156 working lights. But Mr Williams nearly saw his masterpiece go up in smoke when the intricate model began smouldering. “My brother said he saw smoke coming out of it and I looked across, switched it off and decided to rip all the lights out,” he said. An elderly woman was convicted of fraud Thursday after a Nicosia court ruled she took cash from a man to lift a “deadly spell,” using an egg, his briefs and a urine sample. Hayriye Rezvanoglu, 69, will serve 20 days in prison, court officials said. The court found that the self-described witch “clearly and shamelessly” exploited Thanos Savvides’ “vulnerable psychological and emotional state,” and fraudulently obtained 500 Cyprus pounds ($1,243) to lift a spell supposedly cast by his enemies. Melvin and Minnie Lou Scott enjoy the simple pleasures in life in their Texas town and recently a rare one — celebrating their 80th wedding anniversary. At the age of 100 and 99 respectively, Melvin and Minnie Lou may be the oldest married couple in the United States, having celebrated eight decades together last month, the Tyler Morning Telegraph said Tuesday. Where do one legged waitresses work? Why, at IHop of course.